Chill a 12 inch Dutch oven in an ice chest or bucket. Mix pudding and milk in a bowl. In a separate bowl, mix sugar, egg, vanilla and lemon juice. Add whipping cream and condensed milk; stir. Put lid on Dutch oven. Place oven in a large cooler or bucket (large enough to place ice all around oven). Arrange crushed ice and rock salt around oven as you would in an ice cream freezer (alternating 1 inch layers of ice and ¼ inch to ½ inch layers of salt). Lift the lid and stir every 2 to 5 minutes. It will go slowly at first until the oven cools off. Add ice and salt to bowl or bucket as needed. Total freezing time is 40 to 45 minutes. The ice cream may be eaten soft, or if you prefer harder ice cream, you may replace the lid and cover it with ice and salt. 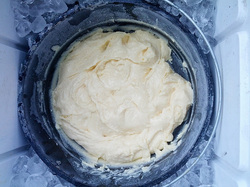 Additional ingredients can be added to ice cream when it starts to thicken. As a side note: be sure to rinse and dry your oven thoroughly when finished, as the salt and water will rust your oven if not cleaned properly.